Talented writer/director Rian Johnson burst onto the scene back in 2005 with his award-winning school-set crime noir, Brick (which I embarrassingly have still not seen), which starred Joseph Gordon-Levitt and brought the sensibilities of Raymond Chandler to a tale of teenage angst and schoolyard mystery. Johnson followed it up with The Brothers Bloom, an entertaining crime caper. 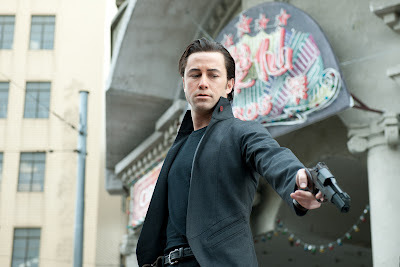 Johnson’s latest cinematic endeavour is Looper, a futuristic action thriller, which reunites Johnson with Gordon-Levitt. 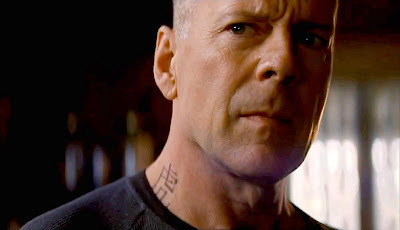 Looper also stars Bruce Willis, Emily Blunt and Jeff Daniels. This is a film brimming with ambitious ideas, and though many of them are familiar to the genre, they have been cleverly arranged and given an intelligent subversion to ensure this experience is for the most part an original, enthralling and thought-provoking one. Set in 2044, Joe (Gordon-Levitt) is part of a group known as ‘loopers’, hired hit men by employers from the future 30 years away, where time travel has been invented. On schedule, Joe travels to a desolate location where his targets from the future abruptly appear. He pulls the trigger, collects his loot and goes on with his life. In the future time travel is outlawed and the mob uses it illegally to send their targets back in time. But there is a catch: the organization that hires loopers will inevitably send their future selves back in time so that the younger killers can wipe them out. This is introduced through one of Joe’s colleagues (Paul Dano), whose loop turns up and he commits the job’s mortal sin, lets his older self get away. After graciously trying to assist his friend, and having to face up to his boss (Jeff Daniels), Joe comes face-to-face with his own (Bruce Willis). Before he has time to eliminate him, Joe is knocked unconscious and his target escapes. Joe's older self is beset on changing something in the past, while Joe wants to close his loop and get on with his present life. Along the way he crosses paths with Sara (Emily Blunt) and seeks refuge on her farm. 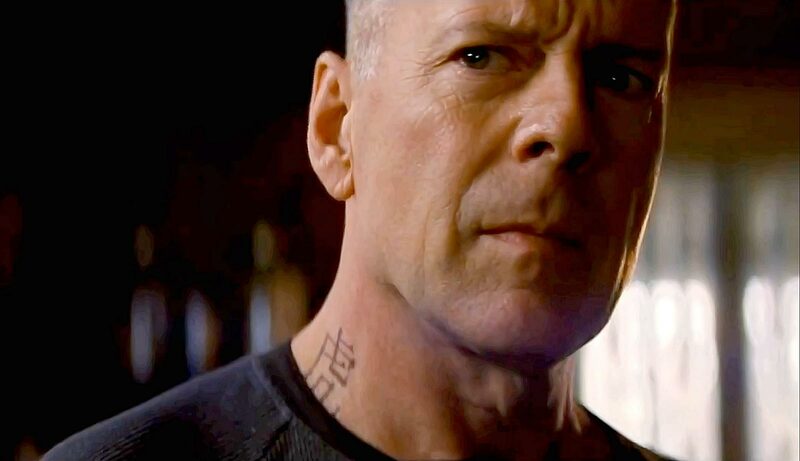 The first hour of Looper is brilliant. There's some fascinating and atmospheric world building - time travel, telekinesis, pharmaceutical drugs, seedy nightclubs, hover cars, silver tablets that exist as Joe's monetary income, and groovy weaponry - and more than a nod to classic film noir again. Johnson situates his brooding protagonist within a scummy, corrupt and palpable dystopia within his elaborate future metropolis. There are chase sequences, a tense and well dialogued one-on-one between Willis and Gordon-Levitt in a diner and watching a character's older self track his younger one is entertaining filmmaking. But once the film relocates in the latter half these exciting and unpredictable features are replaced with an unfocused blend of big ideas and character arcs that aren't of the same vivacious inventiveness. The parallel agenas of both the young and older Joe unexpectedly converge toward another individual, and though the film is resolved in a satisfying way, I think the film was much stronger when it was a cat-and-mouse game between Willis and Gordon-Levitt. I just felt like the film was full of too many ideas. While that may sound ridiculous given how shallow most big-budget blockbuster releases are, I feel it is necessary to mention here. The existence of time travel and telekinesis are acceptable but the presence of the latter is not really explained. To then introduce further supernatural phenomenon when the story didn't really need it, muddled the film's focus somewhat. I found some of these developments disappointing and hard to accept, and felt like Johnson abandoned everything that engrossed me and ran with a new idea. With younger Joe literally 'waiting out' for his older self to show up at Sara's farm, the film's pace stalls and this drama is less interesting than the fascinating earlier events which offers rewards for a thinking audience, throws an audience back-and-forth in time and utilises multiple perspectives in an coherent form. The performances are strong with Joseph Gordon-Levitt continuing to impress. While I enjoyed spending time with Joe - his methodical dispositions are separated by a care-free life of drugs and parties and self-taught French lessons - I didn't particularly like the guy. Still, while those in his profession weren't known for their 'forward thinking' Joe is learning French as part of his plan for the future. A future self he would inevitably meet. It was great to see Willis resurrect his action-hero role, and it is incredible how he continues to be convincing in the physical extremities of his roles. In supporting roles, Blunt was impressive against-type while Jeff Daniels has some great lines as Joe's frumpy boss. Paul Dano (in 'bad Dano' mode I'll call it) gives a brief sniveling, high-energy performance as a fellow looper who screws up bad, and Noah Segen is a thinly drawn colleague assigned with tracking down either Joe at any cost. Also present is the great Garrett Dillahunt and his role, though small, is nonetheless memorable. Issues aside, it is evident that Johnson has tremendous talent as a writer and a director, an eye for mood and the visual (Looper is laced with technical feats, sleek photography from Steve Yedlin and an outstanding score from Nathan Johnson) and the rare ambition to offer up an intelligent high-energy film. Conceptually, Looper is highly commendable, and there are a number of tremendous sequences that will bring shock and awe, but I couldn't help but feel frustrated with some of the developments and that unfortunately resulted in my experience being slightly underwhelming. Explaining why flirts very closely with revealing spoilers, which is why I have been vague. While certainly one of the year's most exciting science-fiction films, it is also a mentally stimulating experience. It is a credit to Johnson for infusing generic elements with his own unique vision, resulting in an atmospheric science fiction thriller that will have viewers craving another look. I'm looking forward to it, mostly because I can't wait to see Blunt in new performance, for the last few years she was playing exactly the same person in every single movie she was in. Great review! This is true. She does play similar characters, but I always find her so watchable (plus she's very attractive) that I don't mind. This is different. She's an American, she's tough, strong-willed and doesn't mind reaching for a gun. I hope you enjoy it! I agree that it was a shame that TT and TK were never explained but personally I enjoyed the country stuff as much as the city beginning. I also thought the whole world was wonderfully designed and it was full of ideas which most blockbusters were just ignore or brush over. This is true. It is certainly full of ideas and for a high-action blockbuster it is very intelligently put together. I also really liked the construction of the world. Especially the city. I found it hard to explain why I failed to be engaged as much with the country scenes, but it was a feeling I had during the film that wouldn't go away. I admired the film, and for the most part, enjoyed it immensely, but just didn't WOW me. Just got back from seeing Looper and was surprised at how dark and some what Omen like it was at times. I found it compelling for the most part but also slightly tiresome in moments. I got distracted by JGL make up which whilst interesting to see at first soon became quite a distraction for me. At one point he looked like a cross between an extra from Star Trek and a member of an 80s band. Was it really necessary? 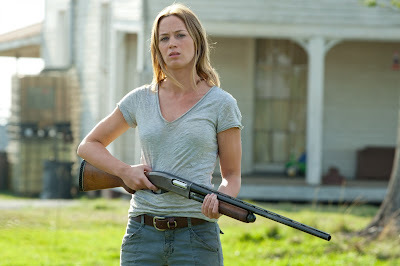 For me Emily Blunt stole the show, her performance coupled with the almost faultless accent was a real highlight for me. Great review as always. I always enjoy Blunt on screen, I think she is an excellent actress. Her accent was spot on - and though I thought the half she is prominent in is the weakest, I liked her taking on a different role. The make-up was an odd decision, but because I was trying to process so much going on, I didn't let it distract me. I enjoyed the film, but I think it is fundamentally flawed. It is compelling, and for its concepts alone it is worth a look. I know plenty will find it awesome. For me, it was an original concoction of previously-explored ideas, but one that perhaps had too much ambition, and this caused the premise to feel strained and ideas left unexplained. Thanks for reading, Will.